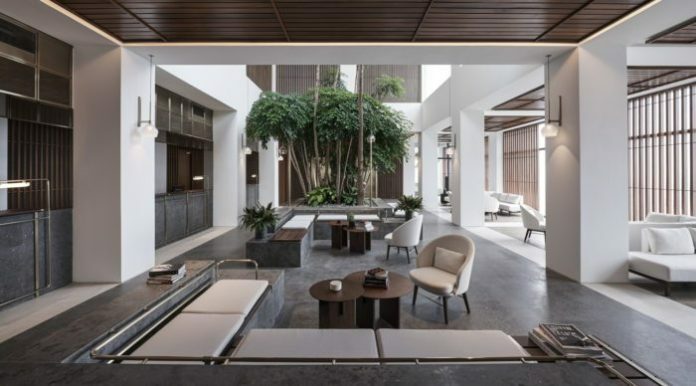 ALILA ‘s first property in Malaysia now welcomes guests at their urban retreat set high above Kuala Lumpur’s vibrant Bangsar district. Taking up the top floors of The Establishment, the five-star Alila Bangsar is a contemporary haven for business and leisure blending a lively city vibe with world-class restaurants and bars. Alila Bangsar’s sleek, dark-cladded façade provides a dramatic contrast to its soothing white interiors. Clean lines and natural tones allow light to stream in while revealing striking views of the iconic skyline with artfully placed lush foliage bringing nature indoors. Meticulously designed by internationally renowned duo Lyndon Neri & Rossana Hu, the hotel’s 143 rooms and suites comprises Studios, Balcony Studios, Deluxe Studios, Deluxe Corner Studios, the Bangsar Suites, and Alila Suites. The spacious interiors come with floor-to-ceiling windows bathing the rooms with natural light and panoramic views of Kuala Lumpur. Guest rooms are equipped with LED television, telephone, in-room safe, minibar and kettle. A dedicated butler service is provided at the Alila Living Room located on every guest floor from the 35th to 40th floors, with all day refreshments to pamper guests with a home-away-from-home experience. Unwind by the pool on Level 40, where its garden landscaping, luxurious loungers, and infusions of natural light give way to spectacular views. The Pool Bar serves retro favourites and local tropical flavours. On level 41, the French semi fine-dining restaurant Entier, takes an avant-garde approach, in nose to tail dining – helmed by Chef Masashi Hirouchi from the two Michelin-starred L’Atelier de Joël Robuchon in London. On the same level, the Pacific Standard cocktail lounge oozes mid-century glamour while serving craft spirits. Rising above all through three levels is Lido, the Rooftop Bar, promising panoramic unadulterated views and high spirits. Made with fresh and authentic quality produce, Botanica + Co offers menus of wholesome and delectable dishes designed to delight guests’ senses. Kuala Lumpur is the home of Royal Selangor, the world’s foremost name in quality pewter whose history dates back over 130 years. Guests can uncover the secrets of pewtersmithing in a tour of the Royal Selangor Visitor Centre, followed by a hands-on workshop at its School of Hard Knocks, learning how to cast, polish and decorate a pewter accessory – a memorable souvenir to bring home. Amidst the busy city streets sprawls the Lake Gardens, a vast park of landscaped gardens and trails. One of the best ways to explore this peaceful green oasis is on a personal guided Segway tour winding through the park’s many unique gardens and scenic spots, such as the Orchid and Hibiscus Gardens, Herb Garden and Deer Park. This guided walk meanders through the back streets and alleys of the city and its suburbs, where guests can discover the city’s hidden food spots and best local eateries. Kuala Lumpur’s melting pot of Indian, Chinese and Malaysian cultures translates into an exciting array of tastes and flavours just begging to be savoured. A tantalising adventure for food lovers. Guests can indulge their culinary passions further in a cooking class at the Lazat Cooking School, located on the outskirts of Kuala Lumpur in a beautiful jungle setting overlooking the lush Penchala Hills. On the morning’s agenda is a trip to a traditional wet market to explore local ingredients, before learning how to cook some authentic Malaysian delicacies in a lovely open-air kitchen. Guests will then enjoy the fruits of their labour for lunch surrounded by the sounds of nature. Those looking for a truly romantic gesture can sweep their sweethearts off their feet with an exhilarating birds-eye tour of the city in a private aircraft. Panoramic views of the skyline and its most famous landmarks from hundreds of feet in the air make for the most amazing photos, and an incredible experience to share with that special someone. Sustainability is one of the pillars of Alila Hotels & Resorts and at Alila Bangsar several initiatives have been rolled out across the hotel such as IPTV technology which allows guests to access destination and facilities information on their TV and the creation of nature-friendly E-Zones to enjoy and help conserve paper. A Press Reader app is available to all guests, allowing access to any magazine and newspaper on a mobile phone or tablet as well as e-check-in via an iPad and paperless invoicing. HOW CAN OPTOMETRY SERVICES HELP YOU?